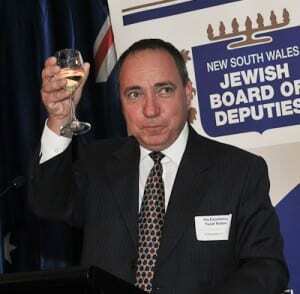 More than 200 people packed Sydney’s Sephardi Synagogue last night to listen to Israeli Ambassador Yuval Rotem address the NSW Jewish Board of Deputies monthly plenum. Coinciding with the synagogue’s 50th anniversary, the meeting was held in the magnificent building as part of the Board’s strategy of rotating its monthly meetings among different community organisations. The meeting opened with Sephardi Synagogue president Benjamin Meyer welcoming the guests, followed by a minute’s silence to honour the 3000 people who lost their lives on 9/11 and the 11 Israeli athletes and coaches who were murdered at the 1972 Munich Olympic Games. Ambassador Rotem lit a candle in memory of all those who were murdered and Peter Wertheim recited the Kaddish. Keynote speaker Ambassador Rotem delivered a broad-ranging overview of the situation across the Middle East, from Israel’s fraught relations with Turkey to the turmoil in Syria and the threat from Iran. Board President Yair Miller paid tribute to long-time deputies Josie and Ian Lacey, both of whom were recently appointed life members of the Ethnic Communities Council of NSW. · The next Board plenum will be held in the Benefactors Hall on October 16 and will feature Gabrielle Upton MP, chair of the NSW Parliamentary Friends of Israel, and Walt Secord MLC, her deputy.